At the request of the French Bulldog breed clubs, the Kennel Club has agreed that it will no longer accept the registration of any merle French Bulldogs from 1st January 2013. - then the merle gene on the M-locus, in double presence MM giving predominantly white dogs. This merle mutation in the SILV gene was detected with a DNA test by GenMARK - but results have been unreliable and the testing has been discontinued. - quote translated: "For the sake of completeness is also referred to the fifth colour variety in this breed. It is the ones by the incomplete dominant Merle-factor produced black/white spotted. As a result of partial depigmentation of the black basic colour in these dogs arises in the classical case a change in genotype from mm to Mm." Breeding for these defect mutations is of course a serious violation of the coat colour disqualification stipulations in the official breed standards. The term merle is used in genetic literature 1935, quote: "Merle is inherited in an autosomal, incompletely dominant fashion" (Mitchell, A.L. (1935) J. Hered. 26, 425-430). Further: "Although rare, a dog carrying the merle allele (Mm) can appear to be nonmerle, which is know as "cryptic" merle, and produce merle offspring. Dogs homozygous for merle (MM) are known as double merles and are predominantly white." According to the geneticist and dog show judge Clarence Cook Little, The Inheritance of Coat Color in Dogs, 1957 which is the fundamental work in this field, there are no alleles on the M-locus in French Bulldogs. But now the Merle pattern has been presumed to be a very old mutation, present in the genome of the common ancestor to all dog breeds. The "jumping" Merle gene is a retrotransposon, which fades the normal hair colour at random on uneven patches into a lighter shade, co-existing with the primary coat colour - in this case black was faded into a greyish blue. Also other primary coat colours are faded on irregular patches by the Merle gene, into for example red merle in Dachshounds, Aussies and other breeds. Merle is not an allowed colour pattern in the FCI Breed Standard for French Bulldogs. Grey/blue is mentioned to be a highly undesirable colour by the American breed club - for genetic reasons. - The Merle gene is autosomal, incompletely dominant. Where the Merle gene has a double influence on the hair pigment the colour becomes white, i.e. totally without any pigment. Homozygous MM is predominanty white and called double white merle in dogs. Such French Bulldogs presumably also exist. Double white merle individuals often - but not always - have serious defects in eyes and ears, hearts, nerves and may have low fertility and viability. The Merle gene is concealed by white and by yellow and other light coat colours: hidden merle-carriers are called cryptic merles M[c].The difference between the Merle and the cryptic gene is the length of the deletion in the merle band. Since this band length can change when the gene is passed on to a puppy, it is possible for it to change from merle to cryptic OR from cryptic to merle between a parent and the offspring. The defect merle gene is incompletely dominant - when a Mm carrier is bred to a non-merle mm carrier with normal genes, still in the worst case 2 puppies out of 4 could be expected to inherit this merle gene mutation. Faded merle patches can sometimes be seen on newborn puppies, but gradually disappear and are invisible after one or a few weeks. Merle can be a common gene in different types of American bulldogs: Follow this link address for photos of different O.E.B. merle pattern varieties. Look at the light yellow chihuahua photographed on Dr. S. Schmutz' web page about merle. It was dna-analysed to be heterozygous with different band lengths on the alleles, 200/500 in the genotype (i.e. probably M[c]m). The cryptic merle gene is shorter. You can't see any merle pattern, but she could give this dominant merle gene on to her puppies. Merle is sometimes also a deadly, lethal defect gene - both in homozygous and heterozygous presence - but it does not negatively affect all carriers. It is concealed by white and light coat colours and is then called cryptic merle in hidden carriers. It is this variety, which causes serious problems in those dog breeds, where merle is a desired pattern: all puppies do not survive, some can have defective eyes or ears and defects in other vital organs, heart failures are common etc. 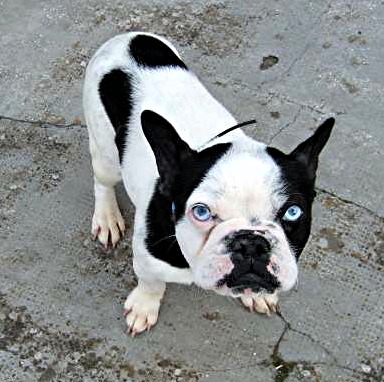 Dogs who are genetically MM sometimes have one or two blue eyes - but so can also extreme white Frenchies when they are homozygous on the S-locus, s [w]s [w]. Even those are unfortunately often deaf, or have impaired hearing on one or both ears. Eyes of different colour is a disqualification in the F.C.I. breed standard for French Bulldogs - and lightly coloured eyes is mentioned as a fault. If any one individual carries two of the genes on the M-locus: M= merle, M[c]= cryptic merle or m= normal non-merle gene - or else deductibly is white on the S-locus s[w], s[p] etc. can only be detected with certainty by a DNA analysis for merle. (A dog receiving the result mm non-merle can in theory still have one parent carrying the Merle gene and siblings carrying the same). 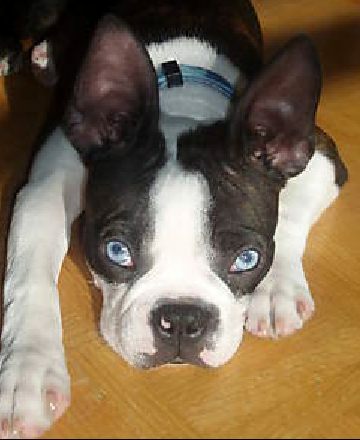 Dogs carrying the merle M gene in single or double setting - or white coat on the S-locus - can have various defects in one or both eyes. An eye could be abnormally small or lack some inner parts, like for example a reflective layer called tapetum behind the retina, which is ment to give the dog better vision in the dark. Tapetum is formed successivly in puppies, but should be fully developed by the age of 12 weeks. 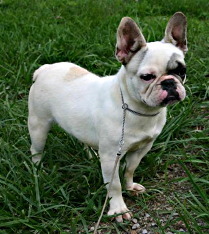 THE MERLE GENE AND WHITE COAT CAN ALSO CAUSE HEARING IMPAIRMENTS - In breeding it is equally bad, what degree of hearing impairment a dog may have, all are equally hereditary: predominantly white Frenchies should threfore be BAER tested for hearing, prior to breeding. Puppies should also be BAER tested before selling, just like Bullterriers and Dalmatians. Prof. George Strain who developed the method recommends not to use any sedation during the testing - it is usually not necessary and an unnecessary cost as well as an unnecessary risk. 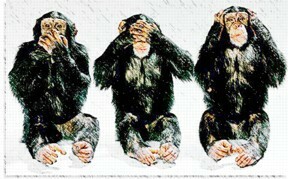 Better not to talk, not to see and not to listen? French bulldogs carry the same colour genes as Boxers and Bullterriers. All white Frenchie puppies should be BAER-tested before selling. Ethically at least all predominantly white Frenchies should be BAER-tested before being used in breeding. 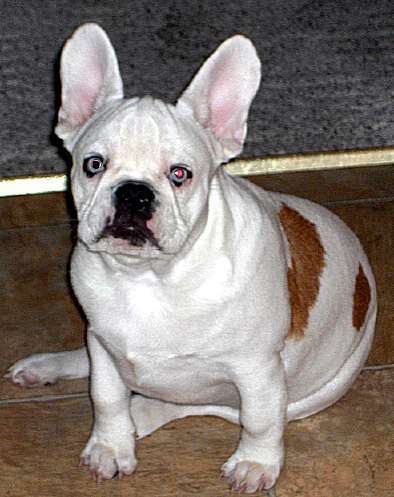 It is impossible to detect a Frenchie deaf on one ear without a BAER-test. Half deaf Frenchies live normal lives, but can pass deafness on to their puppies. Almost 20% of prof. Strain's BAER-tested white Bullterriers were deaf on one or both ears, compared to more than 1% of the coloured ones. According to The American Boxer Club the percentages are similar. The colour markings are the same as in French Bulldogs. White markings are not allowed to cover more than 1/3 of the Boxer body - excess white disqualifies Boxers from breeding and showing, according to the AKC standard among others, although white puppies are accepted for registration. The reason is the hearing- eye- and skin defects that are associated with the lack of melanin (colour pigmentation). 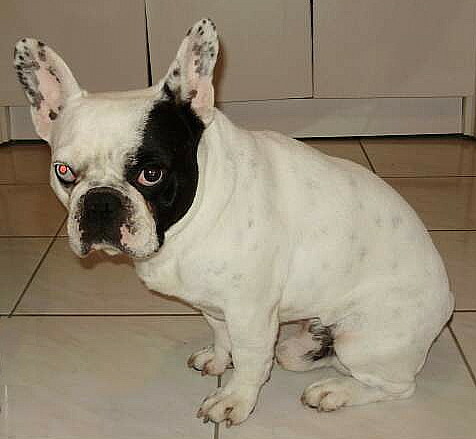 It is an old practice among experienced French Bulldog breeders - never to breed white and white - and this rule of thumb is still valid today: because such breedings earlier did result in deaf Frenchies and in Frenchies with low vitality, who had to be euthanized at the age of one and two years old. Likewise one should not breed white to yellow or fawn to fawn. *One must never breed two carriers of the dominant M or M[c] toghether* - double merle could cause organ defects and low vitality to the puppies. It is important to dna-test possible merle carriers well in advance of a mating. The recessive s[w] extremewhite-allele can give similar malformations, when inherited double from both parents - but there is no dna-test to rule out hidden carriers of this allele. That is why two predominantly white Frenchies should not be mated. In conformity with Section 11b of the German Animal Protection Act the Board of Agruculture investigation recommends prohibition of breedings with two merle-carriers MM or Mm because of the risk for the various defects involved in the Merle-syndrome. Follow the link to read the complete official investigation - search for: merle. Do not confuse the irregular patches of fading primary coat colour caused by the Merle-gene with the even dilution of all the basic colour (leaving no undiluted primary colour) caused by the dilute-allele on D-locus, dd creating a uniform so called blue (or a uniform gray) or very pale red, or weak yellow coat colour - with or without ordinary white markings. This allele may cause CDA Color Dilution Alopecia - a special kind of hair loss. This happens when the pigment grains clump together in the presence of the dilute d-allele, leaving the rest of the hair without any pigment so the colour looks diluted, and causing the hairs to break easily at the root. 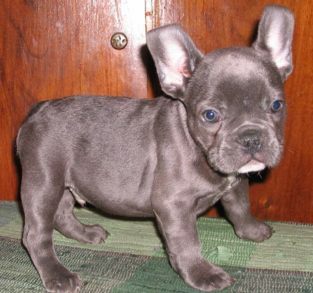 - This evenly blue/gray shade may be the "mouse gray" coat colour mentioned as a disqualification in all French Bulldog breed standards. In conformity with Section 11b of the German Animal Protection Act the Board of Agriculture investigation recommends breeding prohibition for dogs with a diluted blueish grey coat colour because of the defects in the so called "Blue-dog-Syndrome". Follow the link to read the official investigation - search for: blau. was named after the magpie bird - latin: pica pica. In pied Frenchies the more or less brindled, black colour is clear and clean - i.e. without any irregular faded patches of grayish blue against the medium sized white areas. 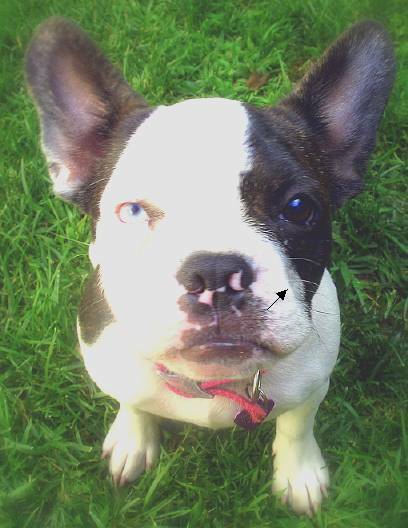 There may possibly be a few so called tickings, on the T-locus - that is round, unfaded black dots - accepted, but not desired, according to the French Bulldog breed standard. Merle (French) or Merel (Germ.) 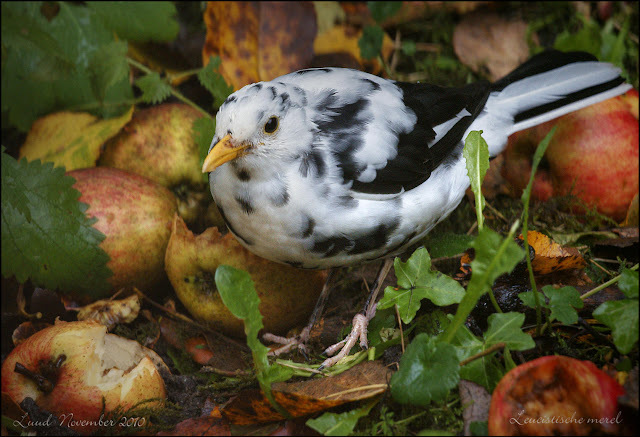 means Blackbird (latin: Turdus Merula) and they can evidently also carry the merle-mutation - seen on this photo by the Dutch photographer Luud Riphagen. Les chiens entièrement blancs sont classés dans les "fauve bringé à panachure blanche envahissante". certaines dépigmentations de la face pourront être exceptionnellement tolérées chez de très beaux sujets. - Truffe de couleur autre que le noir. - Robe de couleur noir et feu, gris souris, marron. Uniformly coloured fawn, brindled or not, or with limited markings. Fawn brindled or not, with medium or overflowing markings. All shades of fawn are admitted, from red to café au lait. Entirely white dogs are classified among "brindled fawn with overflowing markings". a few pigment losses in the face can exceptionally be tolerated in very beautiful specimens. - Nose of colour other than black. - Eyes of different colours. - Coat colours black and fire, mouse grey, chestnut brown. 'Baby fallow deer-coloured' coat, in French 'fauve' and in English 'fawn' is thus regarded as the primary colour in the breed. All shades of fawn are allowed in the breed standard, from red to 'coffee with milk'. Evidently, a French Bulldog may not according to the breed standard carry both black/brown and yellow/red areas in the coat, because "black and fire" is mentioned among Disqualifying faults. Those ever more frequent tricoloured Frenchies with yellow, black and white coat colour patches should consequently not be award winners in shows. In colour genetics this fawn colour is called agouti, 'tan' or 'sabel' and is described as the allele a(y) =yellow. Dogs have a mixture of brown/black and red/yellow pigment grains in their coats - and the alleles on A-locus in the chromosome influence on how this is expressed in each dog. Agouti-locus codes for the distribution of pigment, both in the individual hair and in the entire coat. There is an interaction between black/brown pigment (eumelanin) and red/yellow pigment (phaeomelanin). The regulation of how the two are expressed is conducted by the agouti protein. The coat colour pigments may according to the breed standard be visible in streaks - brindle - or without brindling. Recent observations by Barsh, Murphy, Schmutz et al. place the brindle gene on the K-locus, which regulates the distribution of black/brown pigment. Uppermost in this series is K, which codes for dominant black/brown pigment, without any visible red/yellow pigment being expressed. Its allele k(br) - brindling creates black streaks on a yellow/fawn background. Only dogs genetically carrying the allele for agouti, yellow/red a(y) can display brindle streaks on the entire body. The inheritance of brindle has been disputed. From the beginning Dr. C.C. Little placed the gene for brindle in the E-series for Extension, as the allele e(br) - which could also be expressed only in the presence of the allele for yellow, a(y). The coat may also according to the breed standard have more or less extended white markings - which totally lack colour pigments. These pigment free white markings (fr. 'panachure') can be totally absent (the S-locus for solid colour, i.e. with no white markings) - or be present to various extent under the influence of three alleles: either small, medium or overflowing markings, as in entirely white dogs, which consequently lack colour pigments in their coat and skin. This genetic fact is also made clear in the French standard text, above - but this has frequently been misunderstood and misinterpreted. In genetics a uniform, solid coat colour - without any white markings, as in the Pug - is characterized by the letter S.
S(w) = overflowing white markings - extreme white, as in entirely white Frenchies. - white is not a colour in French Bulldogs, white is more or less extended markings in a haphazard pattern without any colour pigment. - The basic yellow/red or black/brown pigment colours in the breed should never be regarded as markings - they are the primary coat colour, even when white markings (without any pigment) are overflowing in pied s[p] or extreme whites s[w] Frenchies. NOTE: black-and-tan, fr. noir-et-feu, is a disqualifying colour pattern. 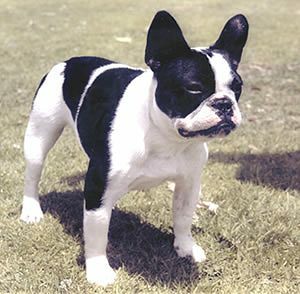 S(p) A piebald or pied French Bulldog has a black/brown or yellow/red coat colour, with or without brindle stripes - and medium sized white markings. S(w) An extreme white French Bulldog has overflowing white markings - and its black/brown or yellow/red coat colour may be visible only on small, insignificant patches in the coat. The transcription factor MITF, which may cause various malformations in the eye, can be detected in all tested dogs, carrying the alleles for piebaldism, those with medium sized white markings s(p) and the ones with overflowing white markings s(w) extreme white, also called extreme piebald. MITF has not been detected in dogs with solid coat colour without white markings (S), and not in dogs with small white markings in the allele s(i). Responsible breeding should avoid mating predominantly white Frenchies with each other, and also Frenchies both having predominantly white close relatives, like parents and siblings. The reason is that att the absence of pigmentation in itself predisposes for skin problems and defects in ears and eyes - as explained above. www.healthyfrenchies.info.se is independent and not officially supported by any breed club. 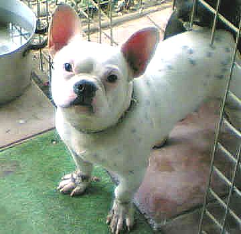 The facts and information given to French Bulldog fanciers is a result of breed research from reliable linked sources.